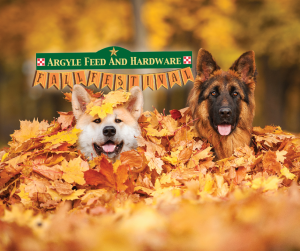 Plan to attend Argyle Feed Stores Fall Festival Saturday on November 19th from 11 am – 3pm. Bring the kiddos and enjoy a bounce house, games and an afternoon cookout. Participate in our Pet Food Drive benefiting Dashing Dog Rescue. Make a purchase of pet food for donation and we’ll deliver it to Dashing Dog Rescue. Dashing Dog Rescue is a foster-based, no-kill dog rescue group. Their mission is to pull dogs from local shelters, get them spayed/neutered and vaccinated, take them into our homes to assess their behavior, and adopt them out to their perfect family. Dashing Dog consists of seasoned veterans (survivors!) of other rescue groups and a 4-member board. They welcome all volunteers—whether you’d like to foster or just have an hour to donate here and there. Their goal is to create a positive, fun experience for the people who volunteer with them as well as the dogs they serve. Currently they have members in Lewisville, Carrollton, Lantana and Coppell. This entry was posted on Tuesday, October 25th, 2016 at 11:46 pm	and is filed under Events, News & Updates. You can follow any responses to this entry through the RSS 2.0 feed. Both comments and pings are currently closed.